A Republic Of Central America Costa Rica, lying between lat. 8° 11' and 11° 8' N., and lon. 82° 28' and 85° 45' W., bounded N. by Nicaragua, N. E. by the Caribbean sea, S. E. by the United States of Colombia, and S. W. by the Pacific ocean; area, about 22,000 sq. m.; pop. estimated at 167,000. Capital, San Jose. The coasts, both on the Atlantic and Pacific, run N. W. and S. E., and are nearly parallel to each other. The breadth of the isthmus between them is at the widest part 100 m., at the narrowest 65 m. The Atlantic coast, which is comparatively low, is about 140 m. long, and is nearly straight, having but two harbors, Matina, on the river of the same name, and Limon, further N., the latter opened in 1857. The Pacific coast is longer and much more irregular, being penetrated by two considerable bays. Near the N. extremity the gulf of Ni-coya or Salinas extends inland 60 or 70 m. and covers an area of not less than 1,200 sq. m.; near the S. extremity is the fine bay called the Golfo Dulce, with an area of 800 sq. m. Both of these are wide at the entrance, which opens toward the south, but grow gradually narrower toward the head, and each has a peninsula lying between it and the main ocean. Chira, near the head of the former. - The main range of the Andes, entering Costa Rica from the southeast, traverses its entire territory, widening toward the northwest, and forming a table land on which are situated the principal towns and centres of population. This plateau is intersected by a series of volcanic peaks, beginning with Orosi (8,650 ft. high), which overlooks Lake Nicaragua, and followed in order by La Vieja, Miravalles (4,700 ft.), Los Votos (9,840 ft.), Barba, Cartago or Irazu (11,400 ft.), Turrialba (12,500 ft.), Chirripo, and the peaks, possibly volcanic, of Blanco (11,740 ft.), Ro-valo (7,021 ft.), and Chiriqui (11,265 ft.). The general elevation of the chain is from 5,000 to 6,000 ft. From the summit of Cartago both oceans can be seen. Near San Jose the range called the Cordillera de Candelaria detaches itself from the main chain, and trending W. terminates on the shores of the Pacific in the volcano of the Herradura (horseshoe). On the east the mountains of Matina stretch nearly to the Atlantic. The table land descends abrupt-lv on the southeast, but forms terraces and gentle slopes on the northwest, subsiding gradually into the plains of Nicaragua. On the Pacific coast, especially around the gulf of Nicoya, the country is diversified with valleys and has a most picturesque appearance. The valley of San Jose is very beautiful. It occupies the centre of the mountainous region of the isthmus, at nearly an equal distance from both oceans, and at an elevation of 4,500 ft. The ground about the capital rises by great undulations eastward to the base of the volcano of Cartago, and northward by more gentle slopes to the Barba peaks; southward it swells to form the San Miguel mountains; and on the west it declines, the undulations gradually disappear, and the broken ground becomes the level plains of the Carmen. Suddenly the inclination becomes more marked, and finally forms a dark and deep ravine, in which the roar of the waters of the Rio Grande is heard. From the Cordilleras surrounding the valley numerous streams find their way into this river, and through it into the Pacific. The upper part of the valley is laid out into coffee plantations, but the lower plains of the Carmen are used as grazing grounds. In the N., E., and S. parts of the republic are dense tropical forests and mountain fastnesses. Along the Atlantic coast is a low, level, marshy tract, covered with forests and subject to floods. A large part of the country is still unexplored, the forests being penetrable only by rough and obscure paths. - The rivers of Costa Rica, although numerous, are inconsiderable in size. The San Juan, which serves as the boundary between it and Nicaragua, is the only one navigable for steamers. The Sarapiqui rises in the hills not far N. of San Jose and flows nearly N. to join the San Juan, whence flat-bottomed barges ascend it to the capital. The San Carlos, another affluent of the San Juan, pursues a similar course, as does also the Rio Frio flowing into Lake Nicaragua. On the Pacific side the largest is the Tempisque, which rises at the foot of the volcano of Orosi and runs S. into the gulf of Nicoya. Smaller streams are the Rio Grande, Arena, Alva-rado, Burica, Palmas, and Dulce, some of which are navigable for barges and canoes. On the Atlantic side are the Reventazon and Matina, which rise in the mountains of Car-tago and, are navigable for canoes for short distances, and the Purissima, Tortuga, Jimenez, Barbilla, and some others of no importance. There are several small lakes, Socorro, Surti-dor, and Barba, at the E. base of the Cordilleras, and Ochomogo near Cartago. - Like the rest of Central America, Costa Rica is of volcanic formation and subject to frequent earthquakes. The soil is generally rich and very productive. Around San Jose it is a dark loam, largely intermixed with volcanic materials. Though less favored in mineral wealth than some of the neighboring countries, it contains some rich gold mines. The most important are those of Aguacate, in the forest of the same name, between San Jose and the Pacific coast, which were first worked in 1821. They were expected to yield $10,000,000 in 1872. Others are said to exist in the unexplored districts on the borders of Colombia, but nothing definite is known of them. Copper, iron, lead, and a brown bitumimous coal are also found, but the mines are undeveloped. The mining in the republic is carried on by British capital. - The climate is as varied as the surface. It is mild and temperate in the uplands, and for a tropical country very healthy. In the district about the capital the thermometer ranges from 65° to 75° F. during the forenoon; from noon until 3 o'clock, during the hottest season, sometimes as high as 82° F.; and at night, during the coldest period, never below 57° F. On the coasts the average is much higher, but on the Pacific the thermometer seldom rises above 85° F. Both coasts are sickly, and are generally troubled throughout the year with fevers, which attack natives and strangers alike. The length and severity of the rainy season renders the climate very trying to the European and the North American. It sets in on the Pacific coast usually during the month of April, increases gradually in intensity up to August or September, breaks up toward the middle of November, and generally ends with that month. During this season the roads are nearly impassable. On the Atlantic slope these periods are nearly reversed, and a much larger amount of rain falls. - Costa Rica is rich in vegetable productions. The greater part of the country is covered with thick forests and jungles, excepting on the table lands, which are generally clear. All kinds of cabinet, timber, and dye woods peculiar to a tropical climate, and the cork tree and the valuable gums, grow to perfection on the low lands, and pines, oaks, and chestnuts crown the tierras frias; in the tierras calientes the cacao, vanilla, and banana have their most luxuriant growth; and in the tierras templadas the sugar cane, orange and lemon trees, and the coffee plant flourish in perfection. Nearly all the great tropical staples may be cultivated with profit. In the more elevated districts many of the products of the temperate zone are found. - The wild animals include the couguar or panther, wild cat, wolf, tapir, wild boar, fallow deer, monkey, sloth, hare, and squirrel. The wooded coasts swarm with venomous snakes and dangerous reptiles. Birds of the most beautiful plumage abound, and insects infest the lowlands. Great devastation is frequently caused by locusts. Among the birds are pelicans, vultures, hawks, parrots, pigeons, ducks, and quail; of domestic animals, the horses are inferior, but the mules are considered the finest in Central America. Immense herds of black cattle are raised, and sheep, goats, and swine of excellent quality abound. The various kinds of barnyard fowl grow to perfection. Fish are taken in the rivers and along the coasts; and the pearl oyster and a shell fish which yields a beautiful purple dye are found. - The population of Costa Rica may be classified as follows: 50,000 mestizoes, 13,000 negroes, 4,000 Indians, and the remainder whites. The latter, who are more numerous here than elsewhere in Central America, are, with the exception of a few Germans, French, and English, chiefly of pure Spanish extraction. It is said that the first Spanish settlers were from Galicia in the north of Spain; and the Costa Ricans appear to preserve many of the characteristics of that hardy and thrifty race. The Atlantic coast is occupied chiefly by Indians. There are also small tribes at the head waters of the San Juan and in some of the unexplored districts. Excepting among these Indians, who speak their na-tive tongues, the language used is the Spanish. The predominant religion is the Roman Catholic, hut the constitution, supported by special provisions of treaties with the United States and Great Britain, permits unrestricted freedom of worship. There is little religious bigotry, and among the higher and educated classes a general indifference in regard to spiritual matters prevails, and the clergy have lost much of their influence. The people are industrious and orderly, and are doing more for the improvement of the natural resources of their country than some other of the Central American states. The centre of population is the district of the Rio Grande about San Jose, where the climate is salubrious. It is estimated that nearly seven eighths of all the inhabitants of the republic are concentrated here within a territory of 50 m. in length by about 20 m. in breadth. - Coffee is the staple production and the chief source of wealth, the soil being peculiarly adapted for its growth. The first plantations were started in 1829. The experiment proving a success, the greater part of the enterprise and capital of the state was soon directed into this channel. In the plain of San Jose the trees flower in March and April, and the berry ripens in November and December. Almost all the labor connected with the picking of the coffee and its preparation for market is performed by women and girls. The crop of 1870 was 27,327,550 lbs. ; that of 1858 did not exceed 11,500,000 lbs. Sugar cane, indigo, and cacao are raised on the Pacific coast, and on the plateau maize in large quantities, wheat, some barley and oats, and tobacco enough for home consumption, are produced. Potatoes are abundant and of good flavor, though small, and frijoles (a kind of bean) and the various vegetables and fruits of the temperate zone are plentiful. The excessive rains are unfavorable to the cultivation of cochineal, cotton, and the vine. Value in U. S. gold. The value of the imports for 1871 was estimated at $2,225,000 in United States gold, of which about 70 per cent, were from Great Britain, 20 per cent, from France, Germany, and other European countries, 5 per cent, from the United States, and 5 per cent, from the other Central American republics. In 1871 the entries at Punta Arenas were: 80 steamers of 125,466 tons in the aggregate, and 35 sailing vessels of 12,541 tons; clearances, 80 steamers of 125,466 tons, and 34 sailing vessels of 12,232 tons. Besides the steamers of the Panama railway company, which make regular tri-monthly trips between Panama and the Central American ports on the Pacific, a steamer of the Pacific Mail steamship company now touches once a month at Punta Arenas. This is regarded as very favorable for the commerce of Costa Rica, for whose coffee it is presumed that San Francisco will soon become the principal market. - Means of communication with the interior are very limited, there being only one good carriage road, that from San Jose to Punta Arenas. On the eastern side merchandise can be transported with difficulty to Limon and to San Juan del Norte (Grey-town) by means of barges on the Sarapiqui to the San Juan, and thence in small steamers down that river. The only alternative is to send across the Panama railway at ruinous rates, or by the long and perilous route around Cape Horn. This will soon be remedied, as a railway is now building to connect San Jose with Limon on the Atlantic, to be extended hereafter to Punta Arenas on the Pacific. Two branches of this road, from Cartago to San Jose and thence to Alajuela, are already (1873) open to public traffic, and the rest is in rapid progress. Carriage roads and other public works are also in course of construction. A telegraph line is in operation between Cartago and Punta Arenas, and a line is projected from Cartago to Limon. - Education is at a low ebb, although efforts have been made of late to increase and to improve the character of the public schools. Primary schools are established in all the principal towns and in most of the barrios (villages in the vicinity of cities), generally for both sexes; but, in consequence of inadequate appropriations and the lack of suitable teachers, they are not very well attended. Young men destined for the liberal professions are usually sent to Guatemala, the United States, or Europe for education. There is in San Jose a national university, supported by the government, where are taught mathematics, philosophy, physics, chemistry, the ancient and modern languages, and political science. A medical course was begun in 1872. There is a museum and a chemical laboratory connected with this institution. There are also several grammar schools in the country, the principal of which are the collegio de San Luis in Cartago and that in Heredia, both under the direction of able Spanish professors. The establishment of a national library is under consideration. - Costa Rica is divided administratively into six provinces: San Jose, Cartago, Alajuela, Heredia, Guanacaste, and Punta Arenas. The principal cities are San Jose, Cartago, Alajuela, and Heredia. San Jose has about 26,000 inhabitants; Cartago, the former capital and the oldest town of Costa Rica, has now only about 5,000; the others have about 10,000 each. The government consists of an executive, called president, elected for four years, and a congress of two chambers, a senate and a house of representatives, the first having 25 and the second 29 members, chosen by the people. The vice president, whose term of office is also four years, is chairman of the senate. The president is assisted by two ministers, nominated by himself, the first having charge of the departments of finance, justice, and foreign affairs, the second of those of the army and navy, the interior, and public works. There is a court of justice in San Jose, composed of three degrees, a court of common pleas, a court of appeals, and a supreme court; and in each parish there is a judge called juiz de par-tido. The financial situation of the country, according to the official publications of 1872, is very promising. The estimated budget for 1872-'3, including the port duty of 50 cents per quintal on coffee and a few other imposts of recent creation, was $2,700,000, a sum sufficient to pay the expenses of the public administration and the interest of the national debt, and to provide for the sinking fund. The principal sources of revenue are customs duties, the monopoly of liquors, tobacco, and salt, and the post office. In 1872 the government increased the salaries of its official employees, disbursed $400,000 for internal improvements, and had a surplus of $300,000 over and above all claims. The public debt at the end of 1869 was about $3,000,000, of which $2,895,000 was internal. The whole of this debt has been liquidated. In 1872 a 7 per cent, loan of £2,400,000, issued at 82, was contracted through the house of Knowles and Porter of London. In addition to this there is a 6 per cent, loan of the nominal amount of £1,000,000, also contracted in England. Both loans were raised for the purpose of constructing the railway and other public works. There are two banks in San Jose, the National and the Anglo-Costarican. Both discount commercial paper freely at the legal rate of interest, 12 per cent., to which rate the former is restricted, but with the latter it is optional. - Costa Rica was discovered by Christopher Columbus on his fourth voyage. On Oct. 5, 1502, after remaining a short time at anchor in the harbor of San Juan, he sailed down the coast, to which, from the specimens of gold he received at the several points where he landed, he gave the name of La Costa Rica y Castilla de Oro. For its history as a province of Spain, see Guatemala, under which name all the country between the S. border of Costa Rica and the N. boundary of Chiapas, Mexico, was included previous to 1821. During the crisis which followed the declaration of independence of the Spanish American colonies in that year, Costa Rica preserved a prudent neutrality, but in November became with the other Central American States a part of the republic of Mexico. A separation was effected July 1, 1823, after the downfall of the brief empire of Iturbide, and a confederation was formed of the five states of Guatemala, San Salvador, Honduras, Nicaragua, and Costa Rica, and the territory of Mos-quitia. This lasted till 1840, when Costa Rica withdrew and formed an independent government. Her president, Don Braulio Carillo, reorganized the administration and honorably satisfied the creditors of the confederation for the part of the federal debt assessed to Costa Rica. In 1847 a constitution was adopted, providing for a president and vice president, elected for six years, and a congress consisting of a house of representative only, of 12 members. Various modifications were made in 1859,1860, and 1863, the presidential term being changed first to three years, and finally to four years. The congress too has undergone numerous reforms. Of late years there have been constant changes in the executive, in consequence of civil wars and insurrections, scarcely any president having been permitted to serve the full term of office provided by the constitution. The present president, Gen. Tomas Guardia, was elected in April, 1872, for the term ending in 1876. In 1856 Costa Rica, fearing for her own safety, declared war against the filibuster William Walker, who had taken possession of Nicaragua. 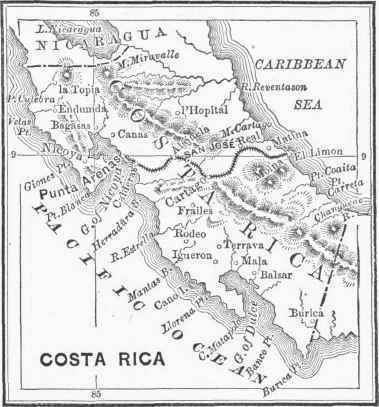 The Costa Rican forces, under Don Juan Mora, the president, met Walker's troops under Col. Schlesinger near the hacienda of Santa Rosa, in Guanacaste, routed them, followed them into Nicaragua, and in conjunction with the forces of the other states surrounded Walker in the city of Rivas and forced his surrender to the commander of the United States sloop of war St. Mary's, under whose safeguard he evacuated the country. On Feb. 17,1872, the ministers plenipotentiary of Costa Rica, Guatemala, Honduras, and San Salvador met in the city of La Union in San Salvador, and signed a treaty for the formation of a Central American union, consisting of the several independent republics. Nicaragua was not represented, but provision was made for her adhesion, and an envoy appointed to visit that government to secure it. The main objects of this union are to preserve the autonomy and integrity of Central American territory, to maintain peace in the several states, and to insure to each a republican form of government, to guarantee to every citizen full political liberty, and to promote progress, moral, intellectual, and material. Slavery is denounced, confiscation abolished, and the extradition of political offenders prohibited. The following are declared to be national undertakings: the building of a line of telegraph from Colon, in Colombia, across Central America to the borders of Mexico; the construction of a highway connecting the capitals of the several republics; the establishment of a line of steamers on the Pacific coast; and the excavation of an interoceanic canal by way of the San Juan river. Provision was made for the convocation of a Central American congress, to consist of three principal representatives and as many substitutes from each state, to frame laws in conformity with the stipulations of the treaty, and to provide for the maintenance of the national authority.